Everything is energy. Atoms are energy. They are comprised of a nucleus surrounded by electrons which give it an electromagnetic charge. Atoms make up molecules which make up cells. Therefore, your body is made of energy and has an electromagnetic charge. Obvious signs of it are your heartbeat. Your thoughts are electrical and can be seen in MRI and CAT scans which are made to view electromagnetic activity and your body needs a certain voltage or energetic frequency for the cells to function properly. I know you want to learn about EFT/Tapping and the first part of this explanation is talking about energy, but please bear with me. It will become clear when you reach the end. The ancient Chinese understood this and identified energetic meridians in the human body which are associated with individual organs. They understood that when the flow of energy in the meridians was interrupted or blocked, disease would set in (usually with the organ associated to the meridian) and when points on these meridians were stimulated by needles (acupuncture) or fingertip pressure (acupressure), the blocks would dissolve and allow healing. Each meridian/organ combination was associated with an emotion. Anger is stored in the liver. Grief is in the lungs and the heart is the center of joy. So, even your emotions are electromagnetic. So, good vibrations are high energy or high frequency. And bad vibrations are low energy or low frequency – kind of like the difference in vibration of a high note on a piano vs a low note. The strings for each vibrate differently. Got it? Great. Okay, if you’ve made it this far – thank you – I’m almost to the EFT/Tapping part. When you are thinking happy thoughts, are in love or feeling appreciation, you are in a high vibrational state. When you are feeling depressed, stressed, sad or angry, you are in a low vibrational state. And since your emotions, thoughts and cells in your body are all connected energetically, doesn’t it make sense that when you are happy your cells respond one way and when you are stressed, anxious, angry or sad they respond another? Right, and this means that when you are happy and relaxed, your immune system is functioning normally and it is busy repairing anything that needs fixing. But when you are stressed, your immune system slows to a crawl because essentially you are in fight or flight mode like when your ancient ancestors were fighting or running away from the local sabre tooth tiger who wanted to eat them. Therefore, when you are in a constant state of stress it may be because of a hectic lifestyle and demands on your time, or it could be because you are carrying a lot of unresolved heavy emotions like anger, shame, guilt, sadness or remorse (just to name a few) that began when you experienced some type of trauma in your life. The trauma may or may not have been life threatening. It could have been from something as simple as a look or comment from a friend, parent or teacher, to a horrible accident or PTSD from armed combat, but it created a negative belief (I am not good enough, nobody loves me, the world is not safe) that is always subconsciously present and maintains a constant level of physical stress in your body. One more thing before I talk about EFT/Tapping. You are almost there – I promise it will be worth it. Do you know about The Law of Attraction? It means that like things are attracted to each other. Since everything is energy, including your thoughts, doesn’t it make sense that good thoughts will attract more good thoughts and good things into your life and bad, negative thoughts will attract more bad thoughts and things? So, if stress from trauma is connected to negative thoughts, emotions and low vibrations, which slows down your immune system, it would be a good thing to change all that negativity to positivity, right? Which is where EFT/Tapping comes in! EFT/Tapping is a powerful energy psychology technique that has been clinically proven to substantially reduce levels of cortisol (the stress hormone) after just one session. 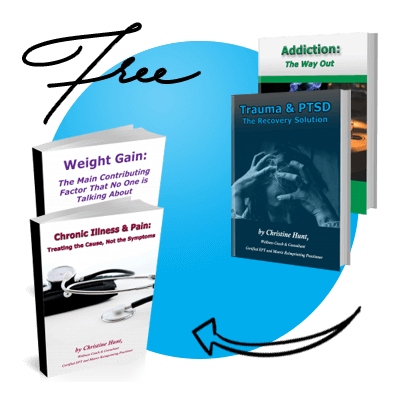 Over 100 clinical studies, published in peer-reviewed journals, have documented it to be over 80% effective at completely resolving trauma, a root cause of stress. EFT is also known as Emotional Freedom Techniques or Tapping, because it involves tapping with your fingertips on acupressure points on your face and upper body while talking about traumatic or unpleasant memories. The talk therapy portion of the EFT process recalls the memory and the related emotions. Tapping neutralizes the negative emotional connection to the memory (which calms the stress reaction to it) and simultaneously releases the energy blockages in the meridian system. The memories are retained but their negative charge is gone and you are no longer triggered by incidents that remind you of the traumatic experience. The result is a fast, thorough release of traumatic memories, emotions and energy blockages. Unlike traditional talk therapy that can last for months or years, EFT gets results in weeks or months. EFT is for those who want swift, extraordinary results for themselves. If negative thoughts and emotions are a low vibration and positive, happy thoughts and emotions are a high vibration and if EFT/Tapping can neutralize negative thoughts so that you predominantly have happy thoughts and emotions, which put you in a higher vibrational state, wouldn’t that reduce triggers of trauma, cravings for addictive substances and food, improve your health, your relationships, your peace of mind, even your wealth and? Of course it would! Recipients of EFT/Tapping repeatedly say how much lighter they feel. Where they once felt trapped in an emotional prison, they now feel free. Joy replaces fear. Guilt, shame remorse, anger, sadness and depression are released. Feelings of inadequacy, unlovability, failure, and other negative thought patterns are neutralized. Stress is relieved and their bodies relax and they feel at ease. When you feel that good, energy levels rise. Brain fog clears and mental clarity and creativity is restored. Physical and emotional pain subsides, inflammation recedes, symptoms of illness are relieved as your body begins the repair process. Triggers dissolve. Addictive cravings disappear. Nightmares stop. Weight is lost. You feel peace and hope for your future is restored. Jack Canfield, co-author of Chicken Soup for the Soul. And EFT is known to have helped people with many more physical and emotional problems. You are here for a reason. You are looking for help for something. What is it? EFT is a beacon of hope amidst a sea of therapeutic chaos. It is a level above other therapies in its effectiveness, longevity and thoroughness. Good people like you deserve to be totally satisfied with yourself and your life. This world is filled with infinite possibilities and the only thing that is stopping you from having whatever you want, is your thoughts. Isn’t your wellness and peace of mind too important to be stuck on a back burner? Do you want to be a better version of yourself? Do you want to let the real you shine and be a master of your health and life? Are you ready to take a step that will change your life forever? Yes, I want to schedule a FREE 15 minute consultation! I am honored to assist you.